Sometimes I cannot believe that I am old enough to have a son in 1st grade, but lo and behold that is where he went on Wednesday. Our district goes back pretty early and yesterday was the kids first day in school. 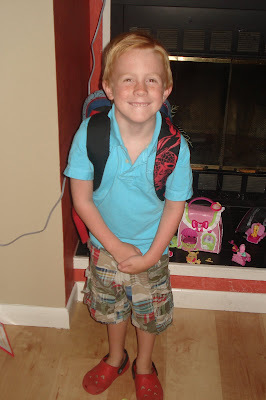 Dylan was so very excited to be in 1st grade this year and couldn't wait to get started. He actually thought Tuesday was his first day and jumped in our bed at 5:30 a.m. saying we had to get up to go to school...oh to have his enthusiasm! So the past two days have been crazy as we have jumped back into the routine. Dylan gets on the bus at his daycare and then his afternoon bus drops him off at my school so we can spend some time together before picking up lil' sis. I love being able to get him off the bus! Last year we had some major bus issues to the point that Dylan did not even want to go to school...this from the boy who raved about his teacher and how much he enjoyed Kindergarten made you realize that it was BAD. Thankfully though God has answered our prayers and he has two wonderful bus drivers this year. So it looks like Dylan is off and running and I can't wait to see how much he grows this year! Here is a pix I took in the morning and the one on the bottom was taken from his assistant principal as he got off the bus. What sweet pics! How proud you must be of your little boy's confidence. He looks so happy to be back at school!! Not so easy for you though right? I know my hubby had a hard time starting back. awe he looks so sweet... I love his shorts!!!! and my son has those crocs but in blue! yea alex is SOO excited about school starting too. so is kari for that matter! HA! ya'll go back to early... today was our last day to get ready for monday. oh gosh is it that time already?? no avoiding it i guess!